This week Walt Disney World Resort is hosting its ‘Monstrous Summer’ press event, which will offer media a preview of what’s going to be coming to Disney World – and beyond. The event is themed after Monsters University, the newest Disney•Pixar movie to hit theaters this summer on June 21st, 2013. Among the activities slated for the press event on Thursday and Friday is a walking tour of what’s still to come in New Fantasyland, interviews with Disney Imagineers, and a presentation and showcase of what’s new with the Walt Disney Company. The DIS will be covering the event with a live blog with photos and even live video of some of the events! Stay tuned right here over the next two days for continued updates on what’s happening! Disney announced that on May 24th, 2013, three of the U.S. Disney parks will be open for a full 24 hours. Magic Kingdom Park at Walt Disney World, and Disneyland Park and Disney’s California Adventure at Disneyland Resort will all be open from 6am on the morning of May 24th until 6am the morning of May 25th. The parks will then close for a few hours and be open for normal operation on May 25th. 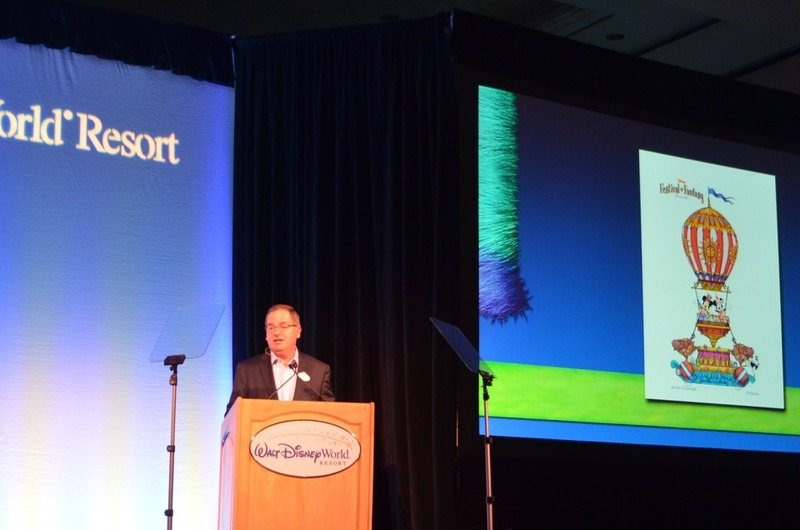 Walt Disney World president, George Kalogridis made the announcement with the help of a huge projection of Mike Wazowski from the the Disney•Pixar films Monsters Inc and the upcoming Monsters University. Take a look at the full announcement and the Spaceship Earth projection below. Disney Cruise Line just announced a refurb of their first ship, the Disney Magic! Included in the overhaul is a redesign of the atrium, updated kids areas and nightlife areas, and a new upper deck water area – including the brand new Aquadunk! The Magic will be going into dry dock in September and October of this year. To view more official artists renderings of the newly enhanced Disney Magic, visit our full gallery here. Imagineer Pam Rawlins gave us an inside look at some of the features of Princess Fairytale Hall, the brand new princess meet-and-greet area opening later this year. Guests will have two options: visiting Cinderella and a friend or Rapunzel and a friend. The friend will be another Disney Princess that will rotate out depending on demand. As of right now, if a guest would like to visit both Cinderella and Rapunzel, two visits to Fairytale Hall will be required. Walt Disney World announced that a new daytime parade will be coming to the Magic Kingdom in spring 2014. 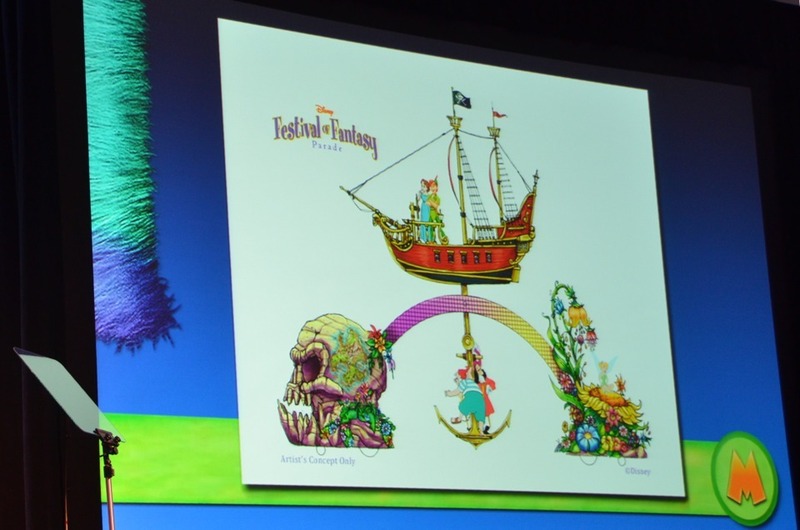 The “Disney Festival of Fantasy Parade” will celebrate New Fantasyland with new innovative floats, costumes and an all-new soundtrack that will feature songs from popular Disney films. A new theme song is also being developed for the parade. In this parade, we’ll see nods to The Little Mermaid, Sleeping Beauty, Dumbo, Pinocchio, Peter Pan, Tangled and Brave, as well as many others. We were able to get a behind-the-scenes look at the upcoming Seven Dwarfs Mine Train and get some information from Dave Minichiello, Imagineer and creative director for the project. The coaster is about 60% completed and is slated to open sometime next year. 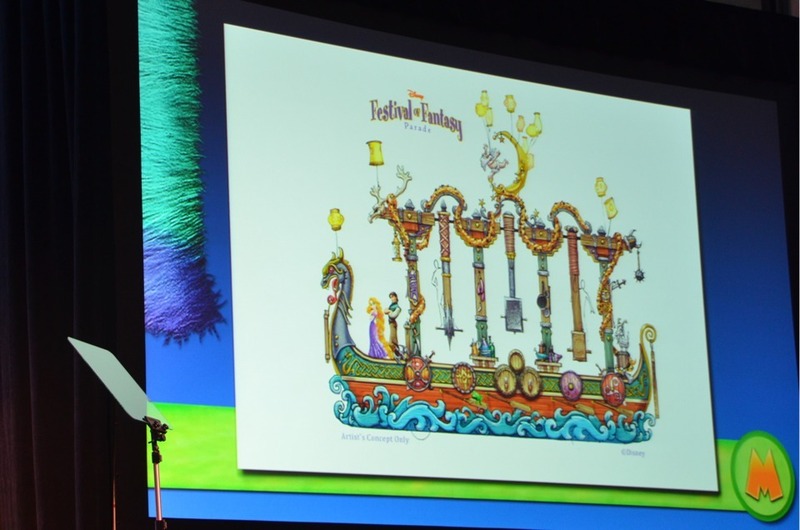 Dave said that the ride will be a family attraction that uses pivoting ride vehicles which will create a ride experience somewhere between Goofy’s Barnstormer and Big Thunder Mountain.